This year we’re bringing you two hunts from an entirely in-house team. Written once again by me with design and construction by Rynn Verwood, this year we welcome Encaitaron Korobase as our technical guru. We’ve been working hard to bring you something new and pull you another step further into the story, and I’m enormously proud of what Rynn and Encait have managed to achieve in the face of my blithe hand-waving and “Well, how about we…”s. You’ll see the second part of the hunt – THE PALACE OF TEARS – in all its splendour when you arrive at Fairelands Junction, but you’ll have to wait just a little longer to discover what secrets lie within. You’ll find hunt HUD vendors at the landing points of each sim in the Fairelands. Grab one and get going. Have fun, everyone. Adventure awaits! Fimbleby’s Wager lasts until the Fairelands fade away after May 11th. 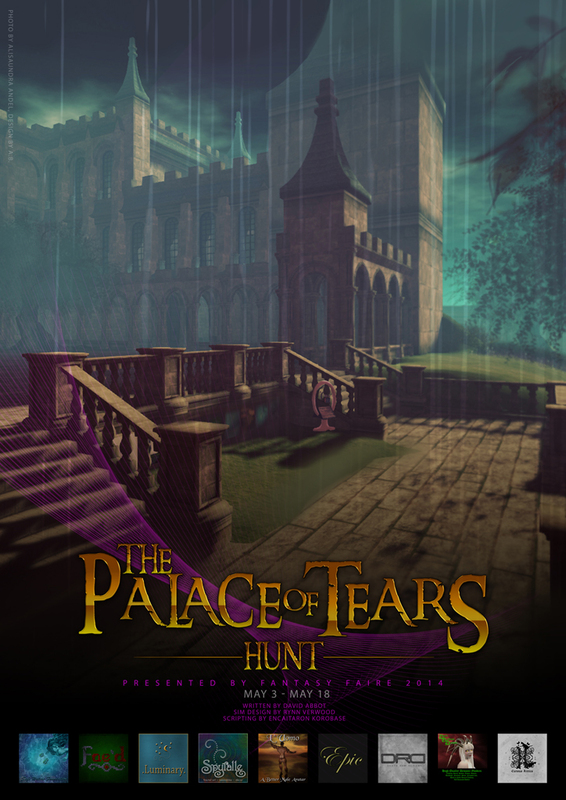 The Palace of Tears will be available for hunters longer, since it is on a separate sim that will stay on the grid until May 18th. The hunt HUD costs 250 lindens, which covers both Fimbleby’s Wager and The Palace of Tears. If you begin hunting only after Fimbleby’s Wager is gone, the HUD will be 150 lindens and cover only The Palace of Tears part of it. The hunt HUDs are available for purchase at all the landing points of the Fairelands, all the HUD money goes to RFL. Certainly one of the best Hunts I have done so far in SL- and believe me, I have done -and survived – a few already. For me, being a huge fan of riddle quests and escape the room style adventures, it is highly pleasing to know that SL can offer .that. as well! Now there is not much time left to do this one, and one hot tip I can give: take the time and do it. Not alone worth every single minute of it- Its one adventure I would like to do even without being -overly!- generously rewarded by the many cool prizes during and at the end of it.